Oh I love this series and especially when I get to Show Off and Brag about someone like Lynda. Her home is fabulous, she is adorable and so talented, plus she and her husband do some of the most wonderful DIY projects you could ever imagine. I adore her style and I am sure you will too, so sit back and enjoy. Hi! I'm Lynda Brandly at Gates of Crystal. I am so excited and blessed to have Marty invite me to be featured on her blog! I am new to 'Blogland' and she has been a daily encouragement to me with her kind words and 'hugs.' She is as lovely and gracious as her home and her blog. I really love how all-of-us-women not only 'fry up the bacon' but find trash on the corner and turn it into something beautiful and functional! There is so much creativity and talent being shared in Blogland. And the encouragement and love is so amazing as we share our faith in Christ, our love for our families, and our desire to make our homes beautiful. My husband and I are definitely 'Do-It-Yourselfers' and over the years have transformed a few houses. I've been a stay-at-home-mom for our entire marriage and have always loved to decorate. We now live on 2 1/2 acres in Big Rapids, Michigan, about an hour north of Grand Rapids. 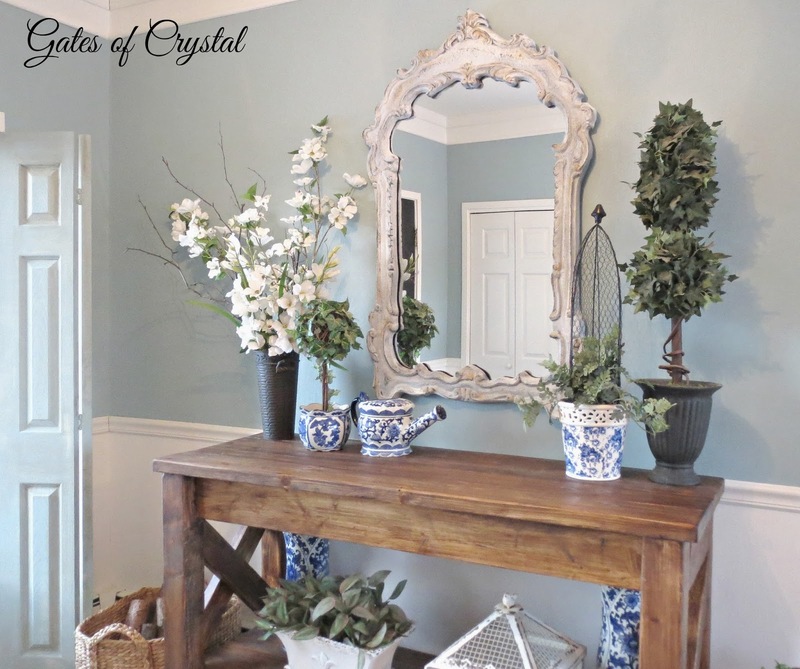 I started blogging after I completely re-decorated our main floor. I had originally done it in French Country reds and yellows and after 10 years, it was time for a change. I realized that over the years I had taught myself to reupholster, sew slip covers, lay tile, sew drapes and pillows, refinish and paint furniture...whatever it took to get it done...and I wanted to encourage other women that 'had a vision' but not the money to buy it. Not a single piece of furniture on our main floor was bought new. 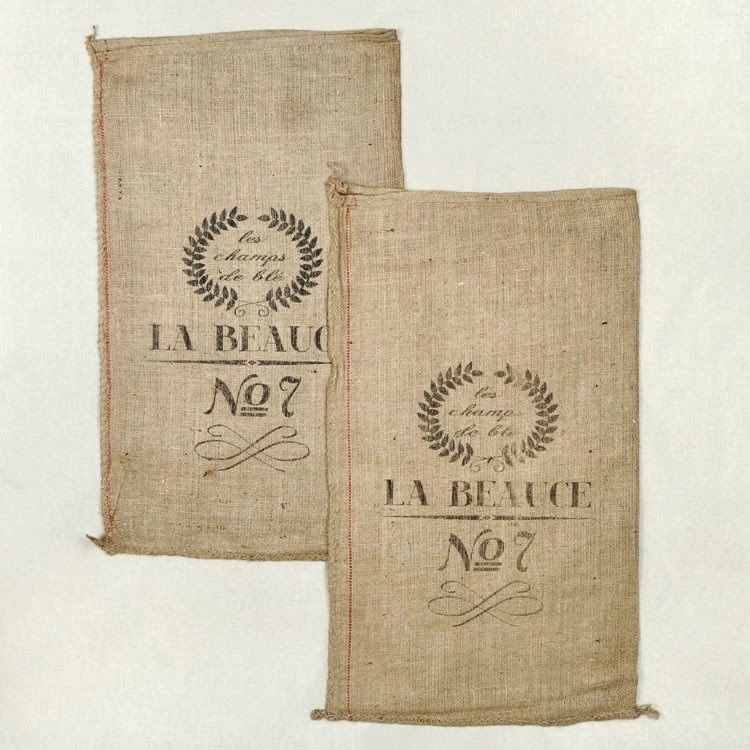 Our home is filled with antiques, estate sale finds, and second hand furniture with a definite lean towards rustic French Country. You can see a lot of the changes in the Spring Home Tour that I posted last week. This year, our super-comfy couch got a make-over when I made this slip cover. I bought this couch second hand 10 years ago when we moved to Michigan and it was getting 'sad.' I oomfed up the cushions and slip covered it in a sturdy, washable cotton. It's now a brand-new-looking Pottery Barn knock-off. I reupholstered this Bergere chair that was originally a dark animal print. It's an Ethan Allen chair and ottoman that I purchased for $100! And we've also been having a lot of fun building furniture! 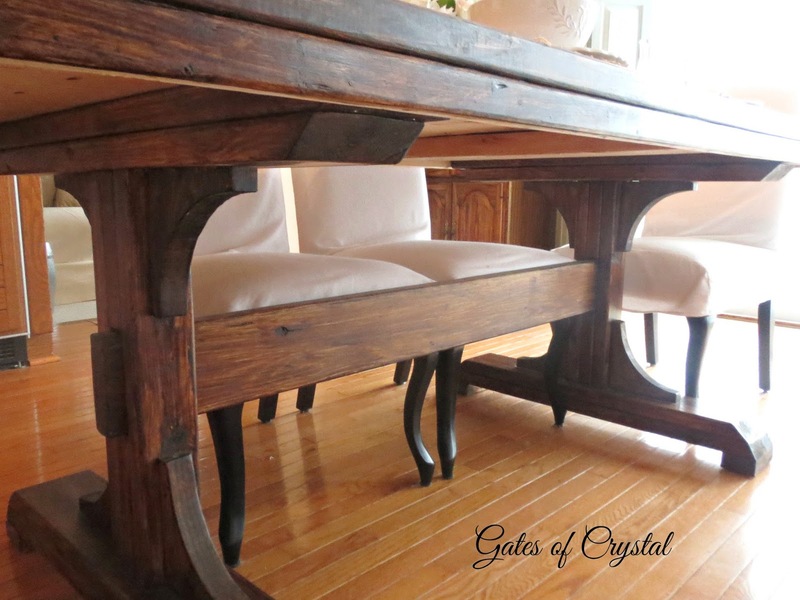 My husband and I built this rustic hall table that sits in our entry way and he also built this beautiful dining room table last year! I'm hoping this year that I can build a few things on my own. Our only space to work is in our garage so I'm waiting for the weather to warm up! 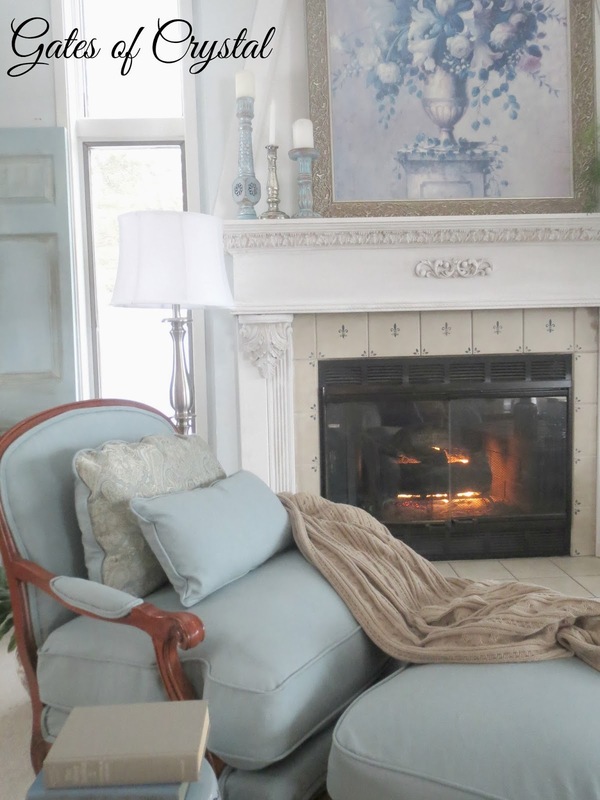 Our living room is now slip covered in fresh white with the same Robin's Egg Blue accents and rustic shutters. You can see the changes this room has gone through here. I've even painted my own art when I couldn't find what I wanted. 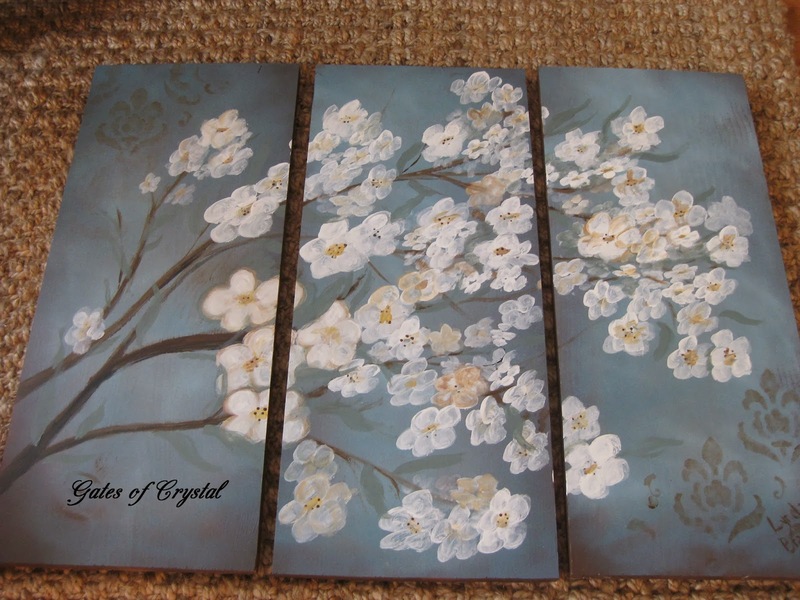 Find out how you can make your own art out of scraps of wood and leftover paint! Our basement makes us feel like we're back in our home state of Colorado. Take a quick trip here. Our master bedroom is a serene hide-away with a wonderful view of the wild life that lives in our back yard. I also love to share all the wonderful encouragements that God has given me over the years. He is Faithful and True and is the foundation of our life and home. My daughter, Laura, joins me occasionally with her adventures in raising two toddlers and teaching them at home. Marty, thank you so much for featuring me today! You are such a beautiful presence in the Blog Community and are appreciated by so many! love and blessings! Don't you love her home, so gorgeous. I love how she uses shutters instead of blinds in the living room with crystals and bling, then how she mixes a cowhide rug with her rustic decor in the basement and make both spaces something you just drool over. Now if you don't follow her, you definitely want to. So be sure to hope over and click that follow button. She is always creating something fabulous. Wonderful intro and visit with Lynda of Gates of Crystal, Marty - thank you. Lynda, your home is beautiful, and I'll be visiting your blog soon. Happy to make your acquaintance! Your home is so inviting and warm Lynda. 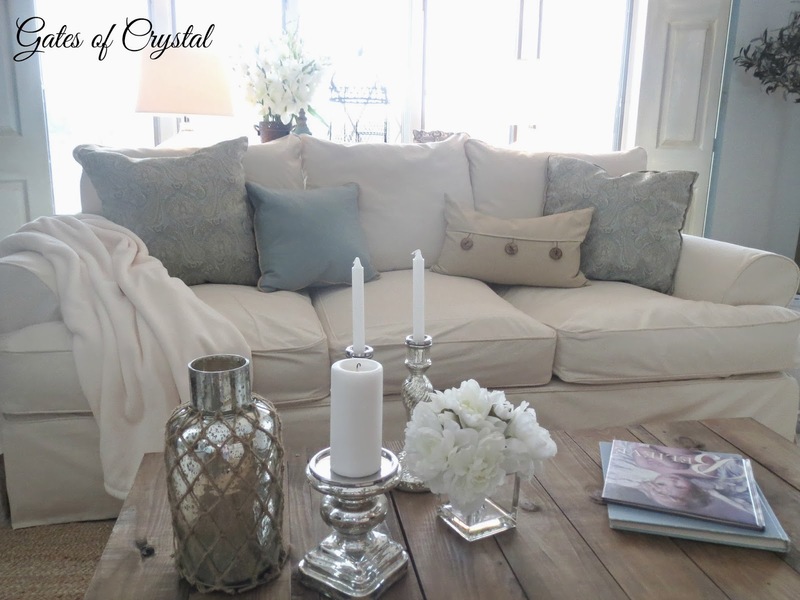 Love the touches of sophistication yet still comfy for lounging about! 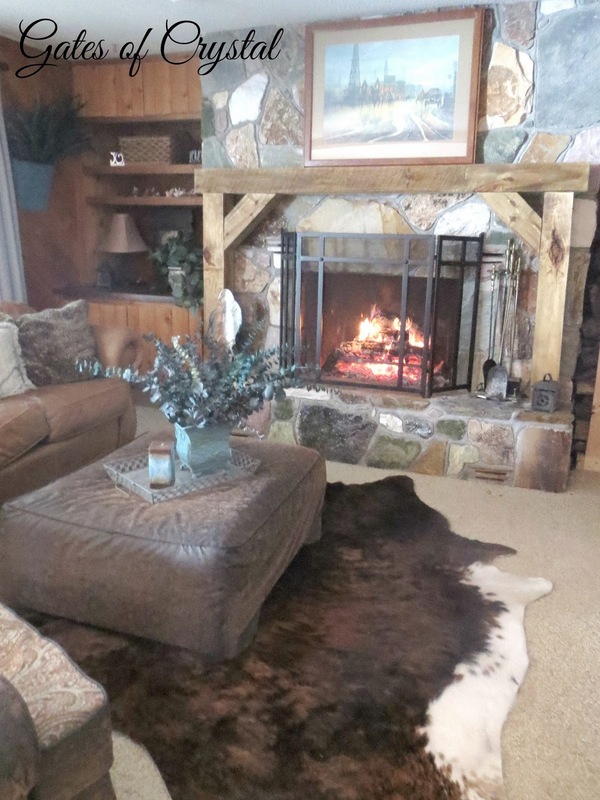 Thanks for sharing your home Lynda! What a beautiful home Lynda has! I love the colors she has used throughout her home. Love the tables she and her husband made. Great feature, Marty! Beautiful home Lynda and her husband have, specially with all the furniture and decorations both talented couple made! Lovely master bedroom. Very warm and inviting. Thank you dear Marty for sharing. Thanks Marty for the introduction . What a luvly home. Will be hopping over to her blog for a peek. Marty - thanks for introducing Lynda to us. Her home is lovely and so is her godly personality. Look forward to getting to know her better. 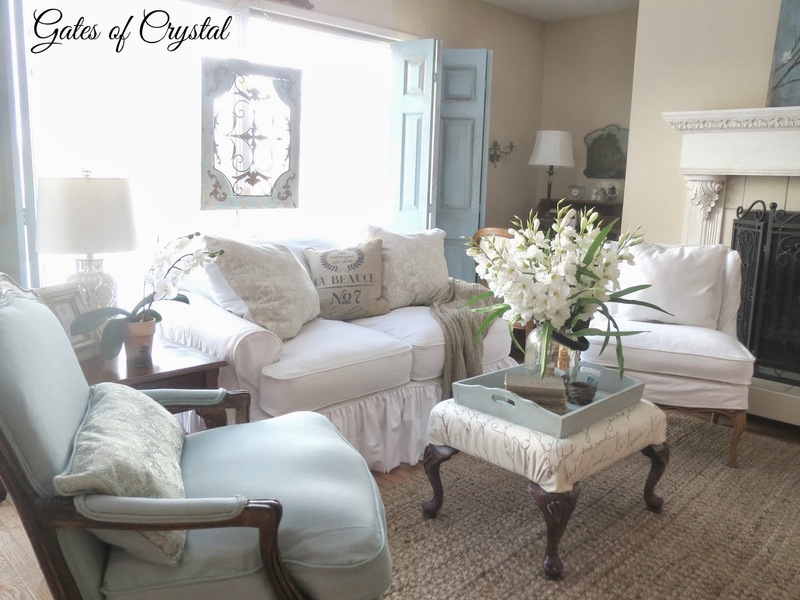 Marty, I love that you featured Lynda's home! I'll head over to see her soon. 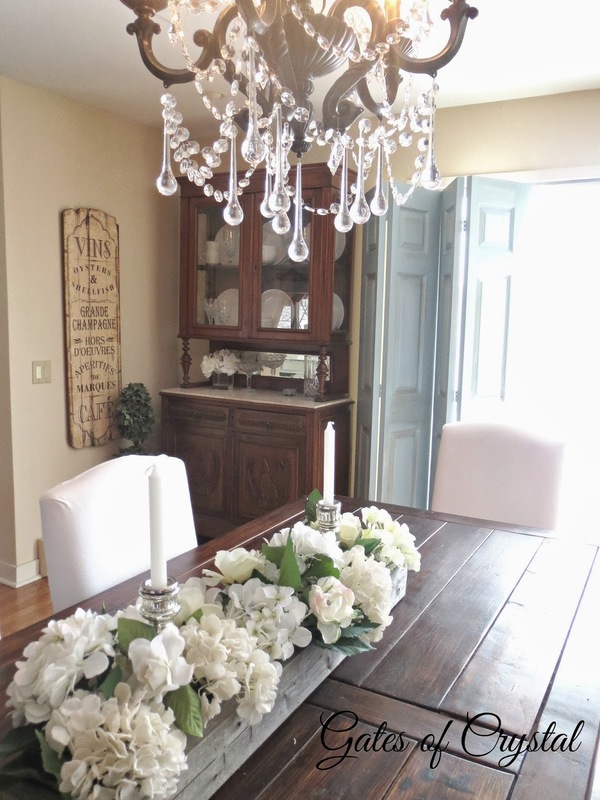 Lynda's home is just gorgeous and can't get over how wonderful all of her DIY projects are, just amazing! Wow- what a beautiful home filled with special touches- loved her colors too! Can't wait to go see her...thanks for the introduction. What a beautiful home. I love her touches of blue. So pretty. Thanks for featuring Lynda. Have a great week end Marty. Marty, thanks for introducing us to new bloggers! Also, I finally got a thank you post done for my winning the $150 gift certificate from glasses.com. Again thanks for all you do for all of us! Happy Spring! Wow, what a lovely home! everything is so pretty! What a gorgeous home - and nothing was bought new - how impressive!!! Marty, thank you so much for featuring me and your kind comments! Also, thank you to all y'all that left such nice comments! We are in Auburn, Alabama visiting old friends and will be back on Monday. I'm happy to have had a few days to refresh my southern drawl! love and blessings! Marty, Lynda's home is gorgeous! Thanks for the introduction and I am heading to her blog now. 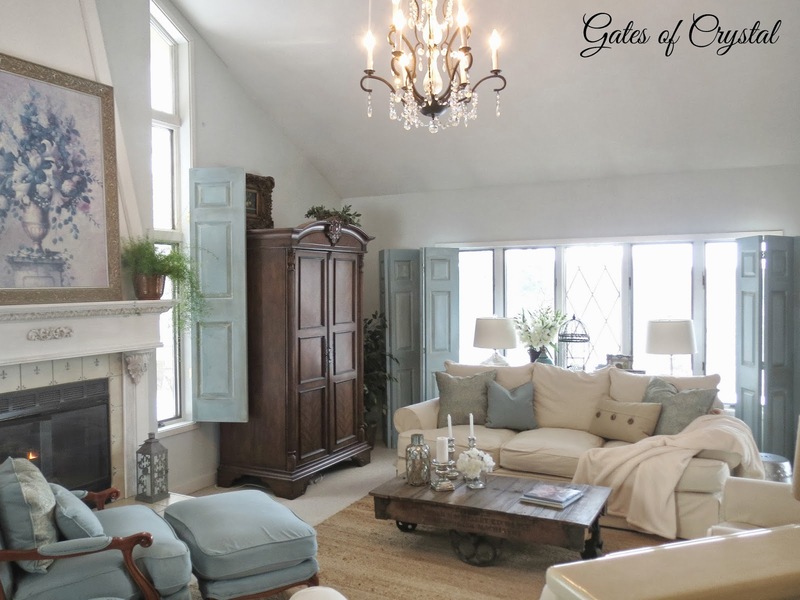 I adore all the creative design throughout Lynda's home! Creating her own art work, totally impressive!!! Thank you for sharing her home with us! Wow! 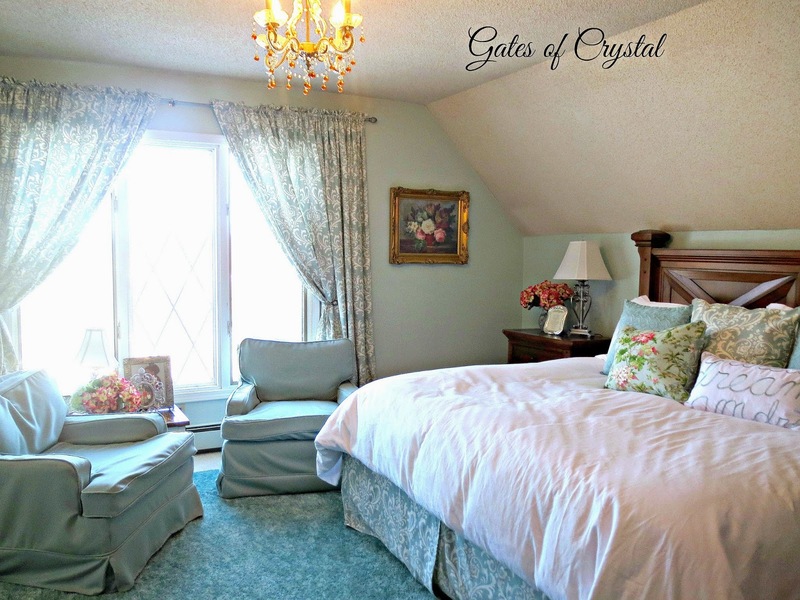 Lynda's home is just beautiful! Thanks for sharing her blog with us...I have missed it before now! What a gorgeous home. Her style is so peaceful and comfortable. I love it.